The risk of pediatric stroke is highest in the newborn period, which includes labor and delivery. Strokes occur when the blood supply to a part of the brain is cut off, often in tandem with hypoxic-ischemic encephalopathy (HIE), trauma, or both. After three minutes of oxygen deprivation, cells begin to die, releasing cytokines, and causing a ripple effect of damage spreading out from the area where blood flow was severed. This can occur as a result of traumatic injury or blood clots. Fetal stroke can cause permanent brain injury, resulting in seizures, cerebral palsy (CP), and intellectual disabilities. Fetal stroke is one of the most common known causes of cerebral palsy in term and near-term infants. Treatment and rehabilitation must be immediate to prevent the spread of damage. Treatment for fetal stroke can include IV fluids, blood thinners (to prevent a recurrent stroke), and prompt hypothermia treatment to slow down the damage and help the brain heal. Fetal stroke (also known as a cerebrovascular accident or brain infarct) is a stroke that occurs between 14 weeks of gestation through labor and delivery. It is caused by blocked or restricted blood supply to the brain. This restriction can be caused by anything that decreases or occludes blood flow, such as hypoxic-ischemic encephalopathy (HIE), trauma, the formation of blood clots inside a blood vessel, or internal bleeding. When the blood supply to the brain becomes blocked, brain cells may die, which can result in permanent brain injury. A fetal stroke can cause cerebral palsy, seizures, and intellectual and/or emotional disabilities. There are two main types of fetal strokes. A hemorrhagic stroke is when brain vessels rupture from trauma. In babies, this can be caused by the use of forceps or vacuum extractors during delivery. And an ischemic stroke that occurs when brain arteries are blocked by a clot. In babies, this can also occur from the use of forceps and vacuum extractors. Birth asphyxia or hypoxic-ischemic encephalopathy (HIE): When the fetus is deprived of adequate oxygen, stroke can result. Trauma: If the process of labor is difficult, or the baby is not well suited to tolerate it, trauma can occur. Improper attempts to deliver the baby can cause trauma. Inappropriate use of vacuum extractors and forceps can cause severe brain damage from brain bleeds, contusions in the brain, stretching and tearing of blood vessels and brain tissue, and compression of the brain with changes in blood flow. Trauma also may occur from the cumulative effect of prolonged periods of contractions and pushing, forcing the baby’s head and brain repeatedly against the mother’s pelvis. All of these traumatic events can cause a stroke. Trauma can also cause the formation of blood clots inside blood vessels (thrombosis), which can, in turn, lead to a stroke. Preeclampsia: When a pregnant woman develops high blood pressure and protein in the urine after the 20th week of pregnancy, it may cause a decrease in blood flow from the placenta to the baby, causing a stroke. Premature rupture of the membranes: This occurs when the membranes of the amniotic sac and chorion rupture more than one hour before the onset of labor. The longer the membranes are ruptured, the higher the chances that the placenta and baby will become infected, which can lead to stroke. Prolonged rupture of the membranes is when the amniotic sac is ruptured or leaking for more than 18 hours before the onset of labor. Chorioamnionitis: Chorioamnionitis is an inflammation of the fetal membranes (amnion and chorion) due to bacterial infection. Delivery by C-section and postnatal treatment with antibiotics need to occur immediately because the baby is at risk for meningitis and brain bleeds, which can cause a stroke. Gestational diabetes: Women with gestational diabetes are at a higher risk for having a macrosomic baby (baby’s weight is >4000 grams; ~8.8 pounds), which occurs because increased blood glucose and insulin levels stimulate fetal growth. Large babies make vaginal delivery more difficult, which may prompt physicians to use a vacuum extractor or forceps, thereby increasing the risk of trauma to the baby. Gestational diabetes also may cause reduced uteroplacental perfusion (RUPP), which reduces the flow of fluids (including blood) to and from the placenta. This leads to endothelial dysfunction, where the flat cells that line the blood vessels are damaged, causing hardened, thickened the arteries. The result is hypertension (abnormally high blood pressure) or preeclampsia, which can be life-threatening for both the mother and baby. Both hypertension and preeclampsia can cause the baby to have a stroke. Placental abruption: A placental abruption occurs when the placenta separates from the uterus before the baby is delivered, causing hemorrhaging and massive drops in blood pressure. This reduces blood flow to the baby’s brain and can cause a stroke. Fetomaternal hemorrhaging: This is profuse bleeding that causes the baby to be deprived of blood and oxygen, which can cause a stroke in the baby. Placental abruption and neonatal alloimmune thrombocytopenia (NAITP) can cause fetomaternal hemorrhaging. Placental thrombosis: This is when intravascular coagulation (blood clotting) occurs in the placenta and veins of the uterus, obstructing blood flow. Twin to twin transfusion syndrome: This is when blood moves from one twin to the other. This may cause both twins to have problems that can cause a stroke. Cardiac disorders, including congenital heart disease, patent ductus arteriosus, and pulmonary valve atresia. Blood disorders due to deficiencies or mutations in coagulation factors and hyperviscosity syndromes which make an infant’s blood more likely to clot or hemorrhage. Blood, homocysteine, and lipid disorders include polycythemia, disseminated intravascular coagulopathy, Factor-V Leiden mutation, Protein-S deficiency, Protein-C deficiency, Prothrombin mutation, Homocysteine, Lipoprotein (a), and Factor VIII. Infections that lead to a hypercoagulable state have been found to be a risk factor for cerebrovascular disease. Central nervous system infection and systemic infection are perinatal risk factors. Maternal health conditions: Congenital heart disease, autoimmune disorders, coagulation disorders or anticardiolipin antibodies. Maternal blood pressure issues such as hypertension (high blood pressure) or hypotension (low blood pressure) are risk factors for fetal stroke. In many cases, the only sign of stroke is seizure activity on an EEG. Ideally, babies who suffered a stroke should have continuous EEG monitoring. Many neonatal intensive care units (NICUs) around the country have the ability to perform continuous EEG monitoring. NICUs that do not have this ability should perform frequent (near-continuous) EEG monitoring of a baby who had a stroke or is at risk of having a stroke. Seizures cause further brain injury; they put a baby at a high risk of having permanent brain damage and cerebral palsy. Because of this, babies should be closely observed and swiftly treated to control seizures. Some of these signs aren’t noticed until well after treatment should have been administered. This is why (1) early, close observation for signs of stroke and (2) early head imaging is imperative. It is crucial for babies who have had a stroke to immediately receive medications to help with blood circulation and perfusion. Sometimes the baby may need supplemental oxygen or a ventilator, especially if the baby had to be resuscitated at birth and/or has underdeveloped lungs (like with prematurity). MRI (magnetic resonance imaging): A test that uses magnets, radio waves, and computer technology to produce images of the brain. MRA (magnetic resonance angiography): An MRI of specific arteries in the brain. MRV (magnetic resonance venography): An MRI of specific veins in the brain. CT scan (computed tomography): A test that produces images of the brain using X-rays and a computer. CTA (computed tomography angiography): An X-ray of specific arteries in the brain. Cranial ultrasound: Where high-frequency sound waves that bounce off organs and create an image of the brain. Lumbar puncture: A procedure performed to collect cerebrospinal fluid for diagnostic purposes. Very quick medical attention is critical after a stroke in order to help prevent permanent brain damage and conditions such as cerebral palsy. However, even with prompt recognition and management of a stroke, some babies still develop cerebral palsy. Often, cerebral palsy occurs when the baby is in distress and the physician doesn’t deliver her quickly enough by emergency cesarean (C-section) delivery. Fetal stroke must be treated immediately. After treatment, the child must have rehabilitation to help ensure that further damage and complications will not arise. Doctors must act to ensure the infant has adequate oxygen and circulation. The medical team may supply intravenous fluids or give blood-thinning medications to reduce the risk of a recurrent stroke. Should the medical staff on duty fail to recognize a stroke, a subsequent stroke is more likely to occur and cause greater damage to the baby’s brain. Hypothermia treatment induced by head cooling or body cooling administered within 6 hours of birth for 72 hours reduces death and neurological impairment at 18 months of age. Combined therapies of hypothermia and pharmacological agents or growth factors to improve neurological outcomes can be used for damaged neonatal brains, such as after a stroke. Sometimes signs of a stroke do not show up for months or years after the stroke occurred. Treatment for a stroke is determined by how old the child is, what signs and symptoms they have, which area of the brain is affected, how much brain tissue was damaged, and whether another ongoing condition was the cause of the stroke. Many different treatments are possible. For example, a child who is having seizures may require anti-seizure medications, whereas a child with a heart defect might need medication to thin the blood. For most children, treatment also involves age-appropriate rehabilitation and therapy. Children who have had a stroke will see physicians that specialize in helping people cope with these problems. These specialists might include occupational, physical, and speech therapists. A child’s care may be overseen by a neurorehabilitation specialist, which is a physician who uses many different types of therapy to help children recover from a stroke. Research examining radiological studies (such as MRI) shows that HIE and fetal stroke often occur together. HIE (birth asphyxia) occurs when lack of oxygen in the baby’s blood (hypoxemia/hypoxia) and restricted blood supply (ischemia) to the brain tissue causes cell death and damage to the central nervous system. Many of the complications that cause HIE can also cause a fetal stroke. Furthermore, HIE and stroke both can cause long-term complications. Hypothermia therapy (brain/body cooling) reduces the risk of death and neurological impairments (such as cerebral palsy) in babies with stroke and hypoxic-ischemic encephalopathy (HIE). During this therapy, the baby’s core body temperature is cooled down just a few degrees below normal body temperature using either a cooling cap or cooling blanket. The treatment lasts 72 hours. It must be given within 6 hours of the event that caused the stroke and HIE in order to be effective. The more severe the hypoxic/ischemic event and stroke, the sooner treatment should be initiated. Hypothermia treatment halts almost every cellular process involved in the cycle of injury that occurs after stroke and hypoxic-ischemic encephalopathy. After hypothermia therapy, the brain injury is typically less severe, meaning that the child may have a less severe form of cerebral palsy or may even be free of cerebral palsy. 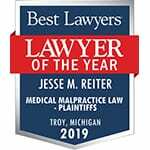 If you suspect that your baby was the victim of medical malpractice related to fetal stroke or resulting hypoxic-ischemic encephalopathy, call the award-winning birth injury attorneys at Reiter & Walsh ABC Law Centers. We’ve handled cases involving dozens of different complications, injuries, and instances of medical malpractice related to obstetrics and neonatal care. While our office is based in Detroit, Michigan, our team is able to handle cases from all over the country. 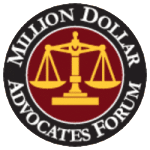 We’ve helped clients and their families in Michigan, Ohio, Arkansas, Mississippi, Tennessee, Texas, Wisconsin, Pennsylvania, Washington D.C., and all over the United States.